This decorative Smiling Moon Solar Stake Light is a stylish garden ornament with an antique bronze effect finish by day, and an attractive solar garden light by night. 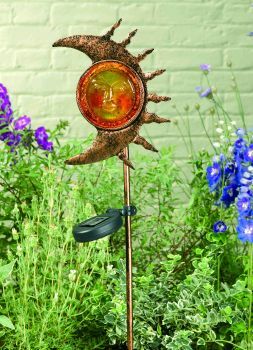 The solar powered light automatically illuminates in darkness, producing a warm glow light effect and making this an eye-catching and decorative ornament for your garden. 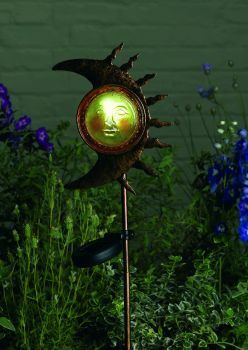 The Smiling Moon features a 3-piece screw fitting ground stake, making repositioning of the stake light simple and easy. The solar panel can be adjusted angularly and fixed at a chosen position along the stake for optimum sunlight exposure. The solar rechargeable and replaceable battery will charge during the day for up to 8 hours of illumination at night during optimum weather conditions. The Smiling Moon face measures 22cm wide and including the stake stands 94cm tall. The face features a single energy saving LED which illuminates the feature and no other cabling or wiring is required, simply stake into the ground and enjoy.